So you've decided you want to stretch your ear piercing. That's great! 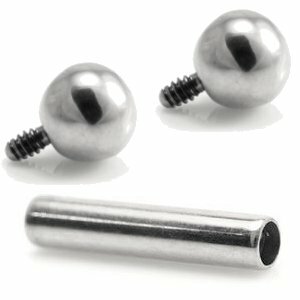 You've definitely come to the right place, because not only do we offer a whopping great range of ear stretching expanders, tunnels and plugs which will get you through your stretching journey in the most fabulous, stylish and funky way, we'll also throw in a bucketload of advice, hints and tips below to help get you started. Then remember this: DO NOT RUSH! No matter how keen you are to be able to insert a whole Polo into your lobe by this time next week, you've got to understand that stretching your ear is NOT a quick process, and that by rushing and being impatient you are only going to cause yourself a whole load of pain and maybe even visible scars, which we will talk about below. It just isn't worth it. Do I Need To Get My Ear Pierced First? Yes. In order to stretch your ear lobe, you must first have a regular, healthy ear piercing. If you don't yet have one then we recommend that you visit a professional piercing expert to have your lobe pierced. As a professional company we never recommend home piercing kits and so we do not give any advice or information on them here. You MUST wait for your new piercing to heal completely. By "completely" we mean no bleeding, no soreness, no irritation, no itching, no redness, no swelling and no gunk (or 'lymph', if you want to use its Sunday name). The skin around your piercing should be its normal colour and feel totally healthy, smooth and pain-free. 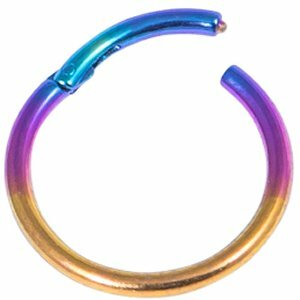 You should then wait at least twice that period of time again to allow your piercing to regain its original, tip-top strength, ready for stretching. 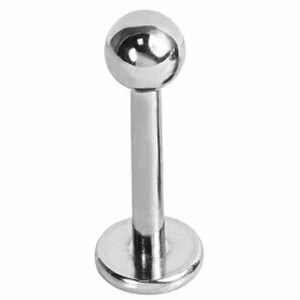 Clean hands, a warm ear, some Body Piercing Aftercare and a correctly-sized stretcher/expander. 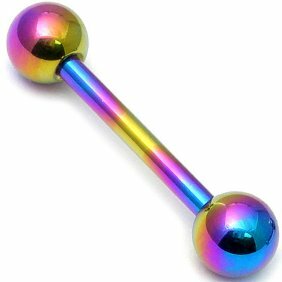 The stretchers right here in our online shop start at 1.6mm, in a choice of steel or funky colourful UV acrylic. If you would like to see how stretchers, plugs and tunnels are measured, check out our Sizing Guide. We cannot stress enough how important good hygiene is. You must clean your hands with anti-bacterial soap prior to starting your stretch, and you must cleanse your ear piercing as well. If somebody else is doing your stretch for you, then they must also scrub up in exactly the same way (and again, so must you, because you're bound to be fiddling with your ear at some point when they're not looking!). 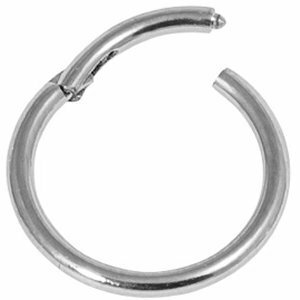 DO NOT borrow expanders (or any other type of piercing jewellery, for that matter) from a friend unless you are willing to completely sterilise them first. Stretching jewellery is relatively inexpensive anyway, so would it not be nicer to get some brand new pieces just for you? After you have made sure that your ear lobe is clean, you need to warm it up to make sure that the skin is soft, relaxed and ready for stretching. A shower or bath is ideal, however holding a moderately hot flannel on your lobe for a few minutes will work just as well. Then you should massage your lobe for at least five minutes (a drop or two of Body Piercing Aftercare is ideal for this purpose) - the massage will aid circulation and help the skin on your lobe to relax even further. 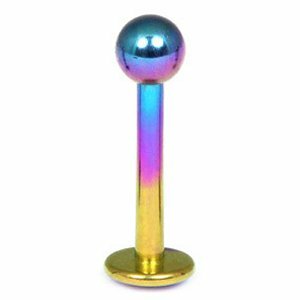 Place a drop of Body Piercing Aftercare onto the narrow end of your expander (and another drop onto your piercing if you like). Don't use too much as everything will end up very slippery. 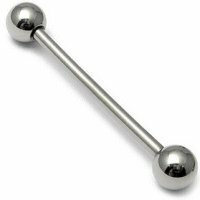 Slowly insert the narrow end of the expander into your piercing hole and push very gently, until it feels just comfortably snug. Take a breather and, when you are ready, step it up a level by pushing a little more - just until you can feel your lobe tingling. It may sting a little, but you should not let it become painful as this will mean that you have pushed the expander in too far. Blood is an absolute no-no! If you draw any blood then you have damaged the tissue and you must cease stretching immediately for this session. It might be disappointing for today but remember - you cannot rush the stretching process at any stage because you will want to ensure that your ear remains healthy for the future. When your ear is back to normal, you can start the above process again. If you are continuing with this stretch, always remember that you do NOT have to push the expander all the way through at this time. 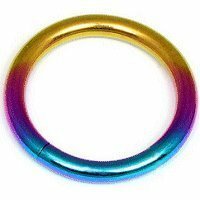 Push away any frenzied urge you may have to get the wider end of the expander all the way through your piercing today - the current size of your piercing really doesn't matter to anyone else and the only thing you will do is rip your skin tissue, and that is painful. Is it really worth it, no! When you feel the tingle, stop and feel pleased with the progress you have made today. When you are happy with the placement of your expander, pop one rubber 'O' ring on either side of your ear and push them both along the expander snugly up to your lobe. And that's it! You can now relax and give yourself a pat on the back. In the days that follow you can gradually push the expander through a little more, making sure that you only push to the level of the tingle again. If your ear starts playing up, don't push the expander any more and wait until it is completely settled before trying again. Take it easy at every stage, there's no rush! Follow this process until you have inserted the widest end of the expander into your piercing, which means that you have successfully stretched to the maximum size of that particular expander. As long as you keep the widest end of the expander in your piercing, or swap it for a plug or tunnel in the same size, your piercing will remain at that size. If you then want to increase further, you will need to buy a bigger expander for your next stretch. How Do I Look After My Piercing Between Stretches? Make sure you keep your piercing clean at all times. Use a salt solution or anti-bacterial, perfume-free soap to clean your piercing twice a day. 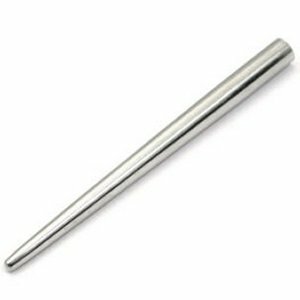 Try to slide your expander out a little so that you can clean both the expander and as much of the inside of your piercing as possible. If you can take your expander out fully whilst cleaning, that's even better. Replace the expander in its correct position afterwards. 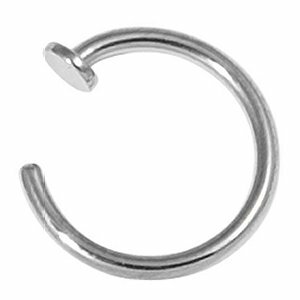 Use a drop of Body Piercing Aftercare to help turn your expander at least twice a day. Expanders can get stuck inside a piercing because the lymph (gunk) from your ear finds its way into microscopic holes and then dries, forming a crust which can be extremely painful to break, even more so in an already aggrevated piercing. Nasties such as dust, dirt and skin cells (yours and other people's) can cause infection and once that happens, not only will it become smelly it is also likely to become swollen, go a menacing shade of red and look pretty darn grim. If you get an infection which does not disappear after a few days, seek medical advice from your GP as antibiotics may be required. That Was Great! When Can I Stretch Again? Give your piercing some time to settle down. What did we say above? No bleeding, no soreness, no irritation, no itching, no redness, no swelling and no gunk/lymph. You need to make absolutely sure that you do not have any of these symptoms when you decide to progress and push your expander in a little more. If you do have even just one of these symptoms, then you must wait until that symptom has gone. Each of these symptoms means that your piercing is distressed and will struggle to take on any further stretching at this time. Let your piercing heal fully. You want people to marvel at your stretched piercing and say it looks great, right? Then make sure the skin around your piercing is healthy, smooth and a lovely colour by protecting it right now and at every stage of the stretching process. Can My Ear Go Back To Its Normal Size Afterwards? It is generally considered that you can stretch up to an 8mm or 10mm without suffering any long-term consequences should you decide to remove your jewellery and let your piercing reduce back to its original size. Of course, this does not apply to everybody because everybody is different. For example, it depends on factors such as skin type, age, and the amount of care taken during stretching. It is very individual and we are not going to guarantee for you that an 8mm or 10mm will reduce back to normal because there will be cases where it will not. However, if you can ensure that you stretch your piercing up in a sensible, hygienic and gradual manner, you give yourself the best chance of being able to reduce your piercing afterwards without any lasting consequences. 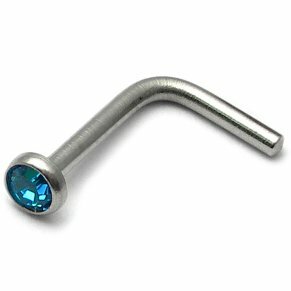 If you intend to stretch beyond 10mm then have a good hard think and make sure it is definitely what you want to do, because it is quite likely that should you ever decide to remove your jewellery and reduce your piercing back down in size, evidence of your earlier stretching will permanently remain. Think of a big stretching (8/10mm or above) like a tattoo - it's pretty permanent unless you want to get work done to fix it afterwards! When Can I Wear Plugs or Tunnels? We offer a super range of Plugs, Tunnels, Claws and Twisters that start at just 2.5mm, and so if all goes well it won't be long before you are able to replace your expander with something equally as cool but a lot shorter! Plugs and tunnels will not help you to stretch your piercing as they are the same gauge throughout (they are not tapered like expanders are). However, with the endless choice of styles and colours available our ear jewellery offers a funky way to express your personality and give everyone something to talk about! Then just get in touch. We welcome all of your questions and comments, so just drop us a line and we'll get back to you promptly.